Now that the dust of election euphoria has settled down, I am back to my routine. Each of my colleagues has been assigned a district to look after. 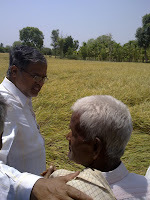 I am the Incharge Minister for Tumkur district. 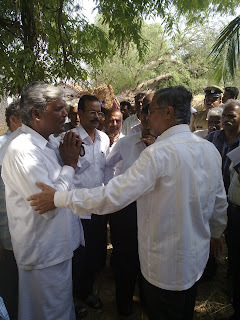 I paid a visit to Sira and Madhugiri taluks of the district today. This may 1st was not a good day for many of the villages here. Huge rain coupled with hailstorm ravaged the tiny hamlets. Plight of the farmers making a living here has become really miserable since then. Hundreds of acres of paddy has been destroyed, so many aricanut trees, coconut trees, plantain plants tumbled down thanks to the thunderous hailstorm. The dreaded day has pushed the poor farmer to a brink. I could literally feel the agony and the ain of each farmer when I spoke to many of them. It was depressing! It left me pensive. We have seen, a doctor always wanting his child to become a doctor himself, advocate necessarily wishing his ward to become another advocate, may be an industrialist also hopes to see his son as an industrialist. All want their legacies to be carried forward. But can we see any farmer wishing his son to become a farmer again? Mostly No! That is the tragedy of our times. There is no security for a farmer; price fixation for the agriculture produce is in no way to his advantage. The agriculture domain is increasingly becoming a non productive one. This is not an advantageous situation in the interest of the Country. In the past, many attempts have been made to strengthen the FARMER. We solely fail to understand “band aid can’t cure a tumor!”. False hopes! Some where I remember to have read, we are eating what we are not producing and we are producing what we cannot eat. If agricultural sector meets a dead end, any amount of money cannot fill our stomach. The agonized face of the farmer really made me to question our societal priorities. Before it is too late we have to think and act to save this priceless sector and instill confidence in our farmer in the real sense. You have any suggestions? There are many friends of sons’ of soil who should also seriously ponder over! 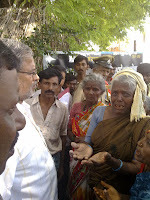 Your concern for the farmers is rightly placed, more so because you are now a minister and you are expected to do whatever you can for the common man. It has also occurred to me as to what would happen to our future gen if all the farmers discourage their progeny from taking up farming. Not only will we have to eat what we do not grow we may even have to eat what we should not be eating - maybe from grass to reptiles to cockroaches, etc. I think the scientists are capable of inventing stronger types/strain of plants which can withstand the vagaries of nature. The answer, I feel, lies with our scientists. Sir, those who have voted for you have done so consciously, knowing fully well about you and your credentials. You haved no reason to worry about what your adversaries have to say about you (abot the expenses incurred on repairing your official residence). Just continue and rest assured, the people of your constituency are with you as we all know that you are a clean man. splendid heartwarming article on farmers plight. We too share the same concern. Nice to see your write ups after a long hiatus. Dear Sir, you told that Bhargavi visited you to continue her studies in MES college, probably she will visit you once more, you can convince her to take up agricultural science. She can contribute for the growth of our agriculture Industries. Agriculture needs like water through canals etc should be prioritised so that people will take to agriculture. Neverthless our agricultural produce is satisfactory. But the agricultural produce is not of good quality and is costly for the abvious reasons. i think the present state government should think seriously about farmersand not merely announcing schemes and programmes it should be brought into practicality otherwise very nearly whole state will run run into horrible situation i think mr cm will think seriously about this and your government needs much more aggressive proactive dynamic visionary agriculture minister then the prevailing.